Please enjoy our Christmas Greetings video that includes highlights of 2013. You'll see a few of Ukulele Mele's students from around the world, shows by The Hawaiian Serenaders, our Alaska Adventure, merchandise and more. Want more glimpses of the past year? Visit our photo galleries, read past event reviews, check out learning options both online and on Maui, subscribe to my video channel, Like Us on Facebook, and more. HIGHLIGHTS: Click on the quarter below to read reviews of events during that quarter. January 12. Play Along with Ukulele Mele Workshop at Bailey House Museum, Wailuku. February 9. Play Along with Ukulele Mele Workshop at Bailey House Museum, Wailuku. March 9. Play Along with Ukulele Mele Workshop at Bailey House Museum, Wailuku. March 16. Queen's Festival at Queen Ka'ahumanu Center, Kahului. March 30. Ukulele Explosion at Kalama Intermediate School, Makawao. April 13. Education Center Grand Opening at Nisei Veterans Memorial Center, Kahului. April 20. Play Along with Ukulele Mele Workshop at Bailey House Museum, Wailuku. April 20. Two workshops at Maui Steel Guitar Festival at Kaanapali Beach Hotel. April 27. Maui Business Brainstormers Event at Maui Dragon Fruit Farm, Lahaina. May 11. Play Along with Ukulele Mele Workshop at Bailey House Museum, Wailuku. June 8. Play Along with Ukulele Mele Workshop at Bailey House Museum, Wailuku. July 13. Play Along with Ukulele Mele Workshop at Bailey House Museum, Wailuku. August 10. Play Along with Ukulele Mele Workshop at Bailey House Museum, Wailuku. August 30-September 2. Homer Ukulele Players Event at Homer, Alaska. September 14. Play Along with Ukulele Mele Workshop at Bailey House Museum, Wailuku. September 21-22. Maui Marathon at Kaanapali. November 9. Maui Ukulele Guild Exhibition at Queen Kaahumanu Center, Kahului. Forty people participated in the Homer Alaska Ukulele Players Event over Labor Day weekend 2013. Some drove 75 miles each way to participate; while some drove over 7 hours away and RV camped for the weekend. Participants attended 16 hours of workshops, small group lessons, and concerts over 4 days, from August 30-September 2, 2013. 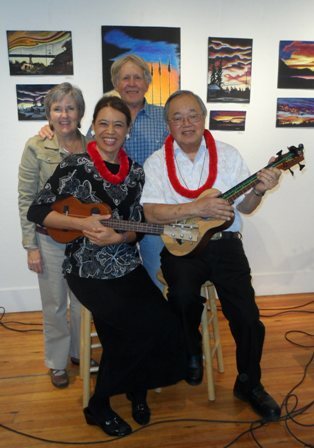 The Hawaiian Serenaders performed two concerts: Friday night for Hawaiian music; Sunday evening for pop and jazz. Friends Marilyn Kirkham and Doug Van Patten are the reason we planned the Homer Ukulele Players Event.